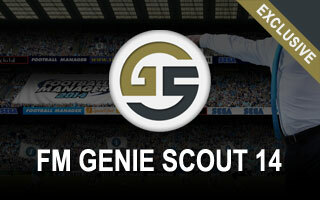 FM Genie Scout 14 public version is here! There was a small delay, but GS14 is now available for all. The wait is finally over, and you can now fully enjoy your FM14. Genie Scout 14 comes with an installer, and it should work for the latest Football Manager 2014 version (14.1.4)! Visit our Genie Scout 14 download page! Eugene had very limited time this year, especially after getting a newborn son recently. But he worked hard and with the help of the people who donated and reported bugs during the closed beta stage, the public version is ready and should be stable. I'm hoping you will appreciate his effort and support the GS project. If you want to donate, please use the Donate to Eugene page. P.S. Our newsletter followers got the download link before everyone else. Maybe you wish to sign up for our free newsletter too. 12 comments have been posted so far. I'm used to getting complaints from people who are used to demanding free stuff as if we're obliged to deliver them. Most happy people don't really comment, while the "unhappy" minority is loud. It's just the way it is. @KostasFM: Not sure to be honest as I can't really try it in a previous FM14 version. Probably not, but try it and let us know. @rafaelos17: I informed Eugene about this. He's aware of the issue and will try to fix it for next version. It is horrible that this thread only has 9 comments, where as the one announcing GS14 has over 100, mainly people moaning about the release date. I've only been a member for a few weeks and haven't contributed apart from this comment, but I have used Genie for the past few years and I am in awe of Eugene, Stam and the FM Scout team. Thank you so very much for once again bringing this tool to the community. Is it works for other versions or only in 14.1.4?? the transfer release clause option doesnt work! !for me at least!doing same thing as last years genie scout bt it doesnt work! @parker008: There's no 14.2 patch out. What are you talking about?